This label, from Skyscraper Brewing of El Monte, California, has some good lines. But Skyscraper was fairly late to the party, getting their first approval in 2008. 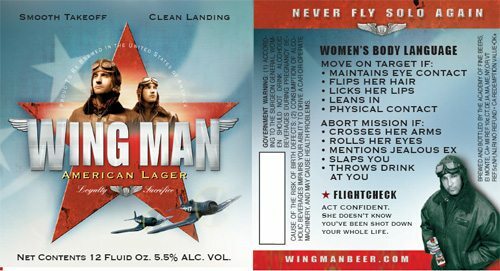 Coors jumped on this social behavior as far back as 2003, with this TV ad celebrating The (mighty) Wing Man. Before that, the term became popularized from the 1986 movie Top Gun and the 1996 movie Swingers.